There are 6 new Grocery offers from SavingStar available from today. 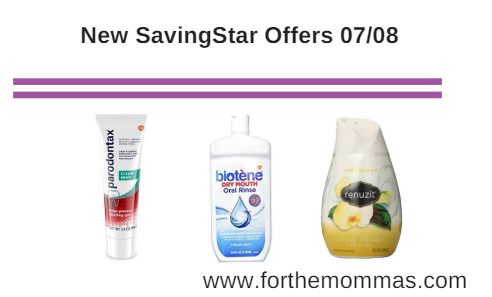 You can save up to $11 on Biotene, Persil, Parodontax, Renuzit and more with the newest SavingStar offers. Save $1.50 when you buy any ONE (1) Biotène® product (excluding 0.8oz sizes)..Expires 8/8/2018.Save $1.50. Save $2.00 when you buy any ONE (1) Persil® ProClean® Laundry Detergent. (Excludes 6 Loads or Less Trial/Travel Sizes. ).Expires 8/5/2018.Save $2.00. Save $1.00 when you buy any ONE (1) parodontax™ product..Expires 8/5/2018.Save $1.00. Save $3.00 when you buy any ONE (1) LamisilAT® product..Expires 8/4/2018.Save $3.00.